MAGICO M3 floorstand speakers 24Hz-50kHz | Audio Reference Co.
HAYWARD, CA – Magico, the leader in high performance loudspeaker design and manufacture, is pleased to announce the new M3. The 2014 release of the M-Project provided a glimpse of the innovative designs and advanced technologies that were being developed at Magico. Since then, we have continued to develop and refine the concepts and vision introduced by the M-Project. The new Magico M3, picks up where the M-Project left off, and not only builds upon its legacy, but takes it several steps further. A new Carbon-Fibre side panel design, an all graphene midrange and bass driver design, a new driver coupling system and the phenomenal 28mm diamond coated beryllium tweeter, previously found only in the M-Project, all come together in what is the most sophisticated loudspeaker we have ever created. Magico is the world’s first manufacturer to utilise graphene in the development of a leading-edge loudspeaker cone design. Graphene has many extraordinary properties and is approximately 100 times stronger than the toughest steel. The newly designed Magico six-inch midrange and seven-inch bass driver cones found in the M3 are both manufactured from Multi-Wall carbon XG Nano-graphene and a new proprietary ultra-stiff carbon weave which is 20% lighter and 300% stiffer than the cone material used in previous Magico loudspeaker offerings. The underhung neodymium base motor system provides an ultra-stabilised magnetic field for the pure Titanium voice coil to operate within. This radical new driver design offers the lowest THD in the industry and sets the performance benchmark for others to aspire to. The M3 midrange driver operates in a purpose built sub-enclosure made of a proprietary polymer that enhances midrange control and articulation. This sub-enclosure concept was first used in the S3 and is now applied to our more recent 3-way speaker designs. Three seven-inch M3 bass drivers are vertically aligned to achieve ideal room integration and reproduce the lowest registers of bass frequency with speed and accuracy. A solid copper gasket is applied between the driver’s chassis and enclosure to maximise the coupling effect and diffuse resonances between the two surfaces. The M3 bass drivers are optimised for minimal music related distortions in the frequency and time domain using the latest state-of-the-art FEA simulation of acoustics, mechanics, electromagnetic and thermal behaviour. The testing process is now completed on a single platform allowing optimisation levels to be taken to a higher level. 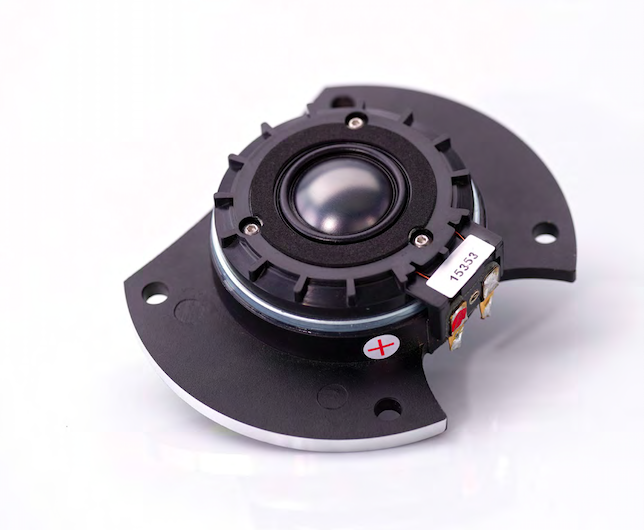 The M3 incorporates the diamond coated beryllium diaphragm tweeter (28-mm) used in the M-Project. The optimised geometry and the diamond coating on the beryllium aligns the acoustical properties closer to perfection without adding the extra weight of a full Diamond dome. 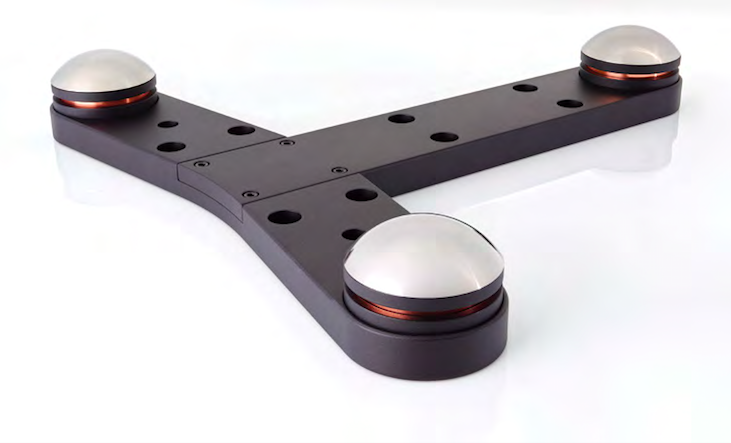 This revolutionary tweeter design offers a near perfect weight to stiffness ratio that is unmatched in the industry. The new tweeter provides extra-long excursion movement and uses a neodymium based motor system that is customised to match the sensitivity and power handling capabilities of the M3 while maintaining ultra-wide dispersion characteristics and ultra-low distortion measurements. An internal three-axis matrix framework encapsulated in a sandwich Carbon-Fibre skin, contributes to an extremely rigid yet damped enclosure and eliminates unwanted resonances and colourations, allowing all drivers to perform with stunning resolution and dynamics. All five drivers in the M3 are acoustically integrated using Magico’s exclusive Elliptical Symmetry Crossover topology. LLC Magico was created over a decade ago for the sole purpose of leading a no holds barred assault on what is possible in contemporary loudspeaker design. Inspired by the unique vision of Industrial designer and accomplished musician Alon Wolf, every Magico product is designed against the true standard of perfect audio reproduction – live music. At Magico, we strive to lead in the creation, development, and manufacture of the most elegant and technologically advanced loudspeaker systems in the world. Each product expresses our passion to craft uncompromising devices that reveal the music as never before. All told, the M3 is the most exciting new product from Magico since the revolutionary M Pro, whose legacy it continues and, in many important ways, improves upon. For those of you hungering for the virtually un-obtainable Pro (only 50 pairs of which were built, most of them pre-sold), Wolf and Co. have finally provided an option that can be listened to and purchased. Whether you’re in the market for such an expensive item or not, this is a loudspeaker you need to hear—something wonderful made better. I will have a full report on the M3 when I receive review samples. EXTENDED REVIEW: After complaining about the (un)availability of Magico’s superb, limited-edition, $129k M Project loudspeaker , I am happy to report that Alon Wolf has done something to make things better. No, he hasn’t built more M Pros, but he has launched an entirely new line of loudspeakers based on the driver and enclosure innovations first seen in the Pro. On a visit to the Bay Area in late August, I spent the better part of two days listening to my own vinyl (I brought some 20 LPs) and select digital files through the first offering in Magico’s new M Series lineup—the US$75k (excl sales tax) M3 three-way, five-driver, sealed-box floorstander—and if this new speaker is representative of what’s in store for Magico fans, you’re going to want to give the M’s a long listen. Wolf claims that the NEW M3 is the most technologically sophisticated speaker he has made. In fact, he thinks it is his best work—but then he always thinks his newest babies are his best work. This time, however, he might be right. The M Pro aside, the M3 certainly sounds different than previous Magicos in ways that are, to my ear, entirely for the better. Though neutral in balance and still blessed with the ultra-high transparency, speed, and resolution that are Magico hallmarks, the M3 has the same strong taste of natural timbral warmth and sweetness from the bass through the treble that I’ve grown used to with the Pro. However, it does something else that even the Pro doesn’t do to the same extent—the M3 pulls off a disappearing act that sets a new high for Magico multi-ways, and a soundstage of dimensions that set a new standard for me in all-dynamic floorstanders. My jaw literally dropped when I listened to The Weavers at Carnegie Hall, a record that (God knows) I’ve heard heard a few times, as the seemingly vast reaches of Carnegie opened up behind the M3s with a width, depth, height, and volume unparalleled from a three-way cone loudspeaker. For once, Carnegie actually sounded like Carnegie. Venue, audience, musicians, and instruments were equally “there”—the hall huge and filled with joyous listeners sitting at various heights and depths, running from the orchestra level up to “glee club” in the top tier of old Carnegie’s wedding-cake layout, the timbres warm and natural, the transients with the genuine snap of gut-and-steel strings, and the individual voices and instruments imaged as clearly as if you were staring at them in a large-format photograph. This is the kind of densely populated, three-dimensionally immersive, wrap-around stage that I’ve only heard in the past with the MBL 101 X-treme Radialstrahler and the slim-line, quasi-line-source Raidho D5.1 (both of which cost a quarter-of-a-million dollars)—and I’m not sure either of those were quite this immersive. Of course, Wolf’s custom-made, reflection-free listening room clearly had something to do with this extraordinary staging and imaging. And I’ll have to wait to get the M3s in my own reflection-filled listening room to see if I can duplicate the feat. (For the record, I can’t quite do it with my reference M Pro/JL Audio Gotham system, which costs considerably more than the M3, or even the M3 paired with QSub15s.) But a good deal of this standard-setting soundstaging has nothing to do with Magico’s bespoke digs and everything to do with the M3’s new enclosure, which is clearly the best the company has engineered. Derived from the Pro (with an added fillip taken from the S Series and a new innovation in driver coupling), the M3’s box uses Magico’s traditional, massive, damped aluminium front, rear, and bottom panels—and its elaborate, bolted-together, aluminium latticework/substructure inside the cabinet—but adds curved carbon-fibre side panels à la the M Pro and a brand-new aluminium top cap (not found in the M Pro) that has a machined-in curve to it. The physical result is the most aerodynamic, diffraction-free enclosure Magico has yet come up with, and the sonic result is the standard-setting disappearing act and soundstaging I just reported on. There is an additional benefit to Magico’s best-ever, lowest-diffraction enclosure that can be heard in the seamless blend between the tweeter and the midrange and the natural warmth of timbres (orchestral strings, such as those on the great RCA recording Rhapsodies with Stokowski and the RCA Symphony of the Air, are simply and breathtakingly gorgeous), though this may also be due to refinements in the driver complement. Indeed, while similar to the M Pro, the M3 uses somewhat more sophisticated drivers than the Pro—its three 7" woofers, have later-gen graphene diaphragms (said to be 20% lighter and 300% stiffer than the nanotube-carbon cone material used in the Pro)—and a new and improved driver mounting system that employs a solid copper gasket to maximise coupling to the chassis and minimise the transference of resonances. The large 28mm diamond-coated beryllium tweeter (the same one used in Q7 Mk II) is also an improvement over the tweet in the M Pro. The other driver in the M3—the 6" graphene-diaphragm midrange—is the same as that in the Pro, and Magico has included the same polymer sub-enclosure for the midrange found in the Pro (and derived from the S Series), which is said to enhance control and articulation, not that Magicos ever wanted for such things. The fact that the M3 uses three 7" woofers, rather than the three 10-inchers found in the M Pro, makes for a slight difference in power-range fullness and low-bass extension (the M3 is said to play on its own into the upper 30s) vis-à-vis the Pro, though the difference is surprisingly small and can be completely eliminated by adding a pair of $22k QSub 15s or $12k JL Audio Gothams to the package, crossed over around 45-55Hz. (For all sorts of reasons, I’m all in favor of using really good subwoofers, like the Magico Qs or the JL Audio Gothams, with full-range loudspeakers.) With the QSubs in and Soulution electronics driving the entire she-bang and TARA labs Zero & Omega Evolution SP audio cables hooking it all up, I would be hard pressed to say that I heard a substantial difference between the M3s and the M Pros on a powerful, deep-reaching pop cut like “I’m the Man to Be” from El Vy’s Return to the Moon. No, you don’t get all the mid-bass slam you may be used to from a ported loudspeaker, but you will still get goose bump raising power, sub-20Hz extension, lifelike tone colour unobscured by port resonance, and the peerless bass-range clarity of a sealed box. SUMMARY: How special? Whatever you play through the M3 sounds like you selected it specifically for the Magico M3, as if it were playing to its strengths. When you realise that you’ve looked at the same loudspeaker as being the ultimate Roots Reggae loudspeaker, the ultimate choral music loudspeaker, the ultimate soft jazz club loudspeaker, you realise that either someone’s been secretly swapping loudspeakers in front of you, or that the M3 is capable of playing everything, and playing it well. Another way of looking at this is a product like the Magico M3 throws down a gauntlet to the rest of the audio industry. It says loudspeakers can be made with lower distortion than hitherto thought possible, and shows a way it can be done. Right now, those who benefit are those who have the depth of bank balance to cope, but it sets a standard that extends above and below that lofty price tag. It means, loudspeaker makers don’t have the excuse to dismiss distortion-laden designs anymore. And that will have a trickle-down effect, both within Magico’s own line, and without. Other makers will be forced to rise to the challenge. And that makes the Magico M3 deserve the highest recognition and recommendation! EXTENDED REVIEW: t’s a harsh truth of the audio business, but a truly honest loudspeaker is as rare as a truly honest politician. The Magico M3 is a truly honest loudspeaker. And it’s only when you hear what the M3 can do with music – all music – that you realise not only how big a paradigm shift underlies that simple statement. The Magico M3 is a direct result of the company’s M-Pro; a limited edition, 50-loudspeaker, six-figure thank you to Magico’s most loyal supporters over the first ten years of the company from the company boss, Alon Wolf. But more than that, the M-Pro (more accurately, M-PROject) was effectively Magico’s ‘concept car’. It was the project that developed ideas and concepts that would form the next generation of loudspeakers from the brand. We hear that a lot, but the reality is few companies walk the walk. Magico is one of the rare exceptions: the research that went into the M-Pro helped create the M3 in a clear trickle-down effect, and it’s likely that trickle-down effect will just keep on going through the Magico line. It’s also possible that the M3 is the start of a new M-Series line for the brand, one that could ultimately unseat the Q-Series in its position of King of the Magico Hill. The talked about changes that the M-Pro brought to the Magico brand were all about the drive units, for good reason. The M-Pro was the first speaker to sport that combination Beryllium and diamond tweeter, the 28mm MBD28, and the first loudspeaker to use graphene in its midrange and bass cones. This forms a core part of the second generation S-Series models, and it now begins to permeate the upper eschelon in the M3, with its single 153mm MAG6004RTC Graphene Nano-Tec midrange unit, and trio of 178mm MAG7012RTC Graphene Nano-Tec bass drivers. It’s worth reflecting on those drive units before moving on. 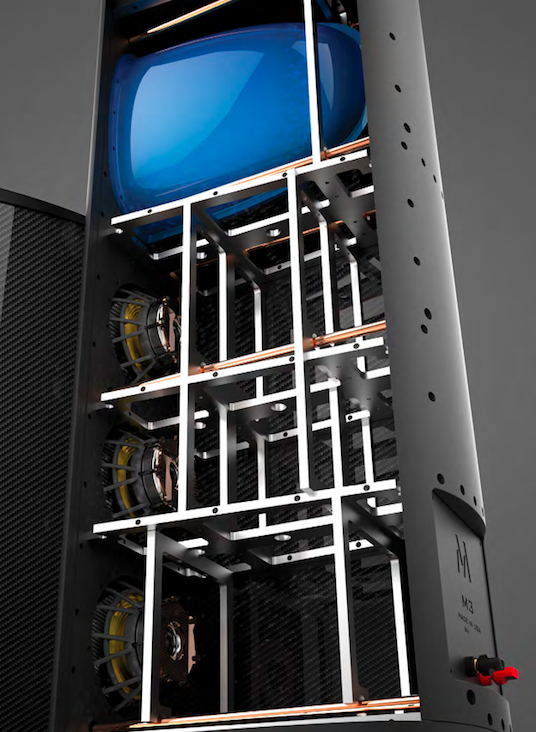 There are diamond tweeters, and there are Beryllium tweeters. Making a Beryllium coated diamond tweeter is rather like trying to make an alloy out of iron and cookie dough. It’s not a ‘done thing’ in the audio world, even if the individual properties of each material in combination would make for a driver that combined the tonal honesty and reliability of Beryllium tweeters with the speed and precision of diamond. Most people – when faced with ‘can’t be done’ try a few times and give up, if we’re being honest about this. Alon Wolf didn’t give up, he just broke a lot of tools finding how to do it! Graphene is a more ‘doable’ thing, with only the one caveat. At the moment this genuinely new material (invented in Manchester, UK 12 years ago) is extremely hard to source, and not – by any stretch of the imagination – cheap. It would be slightly cheaper to make those drive units out of Hermès scarves than it would choosing graphene at this time. But once again... Alon Wolf. But now we come to the bit everyone forgets about the M-Pro. Magico’s loudspeakers are made of sheets of aluminium, hanging off an aluminium spaceframe that forms the loudspeakers ‘skeleton’. Magico hasn’t always been a conspicuous consumer of aluminium, as its first models all featured layers of raw birch ply. But in recent years, it’s been aluminium all the way... until we get to the M-Pro, and now the M3. With these designs, the loudspeaker becomes mainly aluminium, but with carbon-fibre sides, which allow you to create the curvature in an easier way than if Magico made it from pure aluminium. The carbon-fibre also adds a fair amount of damping: it’s basically a carbon wing, having a core of foam, which itself also acts as a good damping material to the aluminium enclosure. You still get to tighten the loudspeaker from the rear with a precise torque wrench adjustment to get the level of internal force just right. The loudspeaker itself sits on a three-footed plinth, with oversized at the front of the M3 to aid stability. Although previous designs used four feet on individual outriggers, three is the magic number for optimum stability... just ask any photographer with a tripod, like Alon Wolf. There seems to be a theme, here! At the base of each of these three corners is an ‘M-Pod’. This is essentially Magico’s Q-Pod constrained layer, low-pass filter foot used for audio equipment, built to a scale capable of supporting the M3. M-Pods are available separately for loudspeakers, and the Q-Pod remains for equipment, but the best place for the M-Pod is under the M3, naturally! Similarly, every last aspect of the M3’s design is treated to the same uncompromising gaze. Whether that’s the selection of high grade parts for the crossover, the use of the unique and proprietary Elliptical Symmetry Crossover technology, nothing is built down to a price, but instead up to a standard. Of course, a loudspeaker of this calibre deserves, demands, and gets partnering electronics of commensurate performance. Yes, you could run these loudspeakers from a single-ended triode amplifier, but the M3 is at its best when it hangs out with the best. You’ll likely hear the M3 on the end of systems that sport names like ‘Constellation Audio’, ‘dCS’, or ‘Soulution’, and it’s that performance grade that allows the Magico M3 to show precisely what it can do. Scrimp on the equipment, or the room, and the M3 won’t expose weaknesses like some kind of audio tyro, but it will Clark Kent its powers. Instead, let it be Superman! There’s a medical condition known as ‘White Coat Syndrome’, where a person’s blood pressure increases simply because they are having their blood pressure taken. The parallel in audio reviewing is ‘White Page Syndrome’, where the process of writing up listening notes in audio are compromised by the listening test. In other words, you are too busy listening to write. This is a rare condition and only happens when you are sitting in front of products that push the envelope of what is possible in audio. Sitting in front of the Magico M3, I had to force myself to write notes between tracks. It’s a sign of the quality of the M3 that the drive was not to make more notes, but play more tracks. When you have gone through the fourth track in a row where the only time your pen sees action is to act as baton for a spot of air conducting, you know you are on to something really special. How special? Whatever you play through the M3 sounds like you selected it specifically for the Magico M3, as if it were playing to its strengths. When you realise that you’ve looked at the same loudspeaker as being the ultimate Roots Reggae loudspeaker, the ultimate choral music loudspeaker, the ultimate soft jazz club loudspeaker, you realise that either someone’s been secretly swapping loudspeakers in front of you, or that the M3 is capable of playing everything, and playing it well. One of the truly remarkable things about the M3 is just how undistorted it is, unless you are really caning the volume control. You can happily sit back, play ‘Georgio by Moroder’ from Daft Punk’s Random Access Memories [Columbia] relatively loud at the outset, then as the volume level of the track increases, you don’t notice it getting louder because it’s a ‘clean loud’. Pretty soon, you are playing at well over 100dB and don’t care. A lot of this comes down to that incredibly dead cabinet. Here’s a test: play something fairly loud, with deep bass and strong dynamic shading. The usual earth-mover stuff. Now walk up to the loudspeaker and gently rest your fingertips on its flank. In ‘most’ cases (practically every loudspeaker I’ve ever tried, and I’ve tried a lot), you will feel some degree of cabinet movement beneath your fingers. Sometimes, you’ll feel the cabinet resonance so profoundly, you could put your less sensitive palm down on the side of the loudspeaker and still feel the music pulsing through the cabinet like bone conduction. But not with the Magico M3; nothing, nada, bugger all. If you are careful, you can balance a coin on the top of the M3 (it’s a curved top, so it’s not easy), and it will stay in place no matter the sonic output. It’s not just about playing impressively loud. In fact, that cabinet coupled with the drivers make this a deceptively subtle loudspeaker at all volumes. The tonality of the M3 doesn’t change whether you are playing at a whisper or at the point where you should be considering your hearing. Magico loudspeakers have always been good at delivering a consistent sound across the volume levels, but there was always a roll-off point where at very late-night levels, you began to feel like the bass drivers were in their ‘resting’ phase. Not so here, and this loudspeaker is outstanding even playing at a whisper. All the subtle textures and interplays between musicians that you usually hear at higher listening levels hold at more quiet levels. But when it comes to ‘interplay’, you can’t get much better than King Curtis Live at Filmore West [ATKO]. recorded just a few days before his tragic death, the opening track ‘Memphis Soul Stew’ is a firm favourite of mine. It is a simple, untampered mix straight off the live listening desk, it starts relatively subtly (with just a bass line) and builds to a full touring funk band sized contingent taking the stage. The M3 takes this in its stride, to the point where the electronics and transducers simply melt away. This still isn’t the real thing, but it gets closer than most. As mentioned before, the M3 is derived from the M-Pro, and precisely what do those lucky 50 owners get that edges out the M3? Simply this; bottom-end authority. The combination of a sealed box and a trio of 178mm drive units makes for a tight, ordered bass in the M3, but the M-Pro brings that tight, ordered bass into the bottom octave. Those used to the sort of grunt a ported cabinet with a 250mm paper cone driver will find that sort of air movement wanting in the M3, but equally, those used to more refined, dry, and precise bass control would find that kind of ‘phat’ sound flabby and uncontrolled. And yes, those obsessed by full-range demand sub-20Hz frequency response, and the M3 sets its lowest point at 24Hz, but if they thought about it a little more, many would rather have a more precise and controlled roll-off (because it tends to create less problems in room, and can be augmented by a good subwoofer) than something deeper but more wayward. Personally, I’d take that elegant midrange, effortless top end, and precise bass over deeper, but less well controlled bottom end any day. Is it possible to get both? 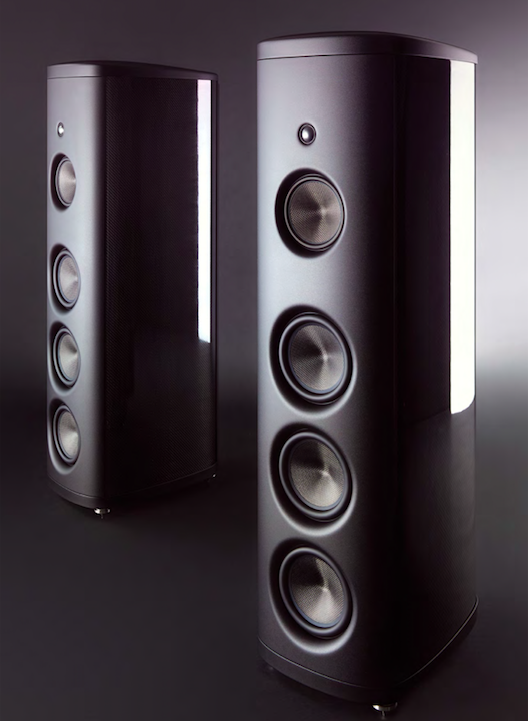 I’d say yes (up to a point), but to get to yes doesn’t come cheap, and as we are already looking at a loudspeaker that costs £99,998 per pair, the term ‘doesn’t come cheap’ takes on some pretty heavyweight financial considerations. The aforementioned ‘up to a point’ is key, though. Because what the mid and top of this loudspeaker does is near impossible to replicate in other loudspeakers. It has the combination of a seeming point source imaging, electrostatic-like clarity and openness, and dynamic loudspeaker energy and scale. In other words, the best of all possible worlds from about 35Hz on up. My time with the M3 was all too brief, but it had a profound effect on me, and it should be heard by one and all to make that effect more commonplace. It was clear from the first bars that this is one of the most important loudspeakers I’ve reviewed. OK, so an almost £100,000 loudspeaker limits the significance of that statement, in the same way as what happens in the most important Ferrari isn’t as significant to most people as what goes on in a new Fiat. But, another way of looking at this is a product like the Magico M3 throws down a gauntlet to the rest of the audio industry. It says loudspeakers can be made with lower distortion than hitherto thought possible, and shows a way it can be done. Right now, those who benefit are those who have the depth of bank balance to cope, but it sets a standard that extends above and below that lofty price tag. It means, loudspeaker makers don’t have the excuse to dismiss distortion-laden designs anymore. And that will have a trickle-down effect, both within Magico’s own line, and without. Other makers will be forced to rise to the challenge. And that makes the Magico M3 deserve the highest recognition and recommendation! the Magico M3 represents the almost clichéd term ‘state-of-theart’ in a way that few speakers can truly claim…..this is a top-to-bottom piece of loudspeaker art. Magic. Playing familiar material, the M3 presents an outgoing personality that demands your listening attention. No sweetness or bloat or ‘warmth’, just pure neutrality. The M3’s class-leading dynamics and bass control and detail – no doubt partly due to the sealed enclosure and partly due to expert crossover design – are phenomenal. It’s an effortless low-end that hits in the chest while providing extraordinary levels of micro-detail, be it bow on strings, from acoustic to finger-picking electric bass. And don’t even bring up the kick drum… a truly concussive experience. There’s a feedback loop within product design. As a brand expands its market reach, its profi le and cachet grow. And in parallel with such an advance, the natural progression of product design may take things to a point of re-evaluation. A good engineering based company will then analyse its position, reassess its technologies, and perhaps engage and energise the Research and Development department into a re-examination of existing products and, with the required budgetary injection, further advance them with a view to reinventing the brand flag ship. With a new flag ship in place, that new tech can trickle down to new lower-rung models... and so the circle continues. Since its inception, Magico – headed by industrial designer and musician Alon Wolf with his committed team of engineers – has dedicated intense efforts into developing highly-engineered drivers and heroically inert enclosures, with each generation of products featuring further refinements. This steady progress led to development of the limited-edition M Project in 2014. The speaker’s implementation of the company’s best technologies positioned it at the very cutting edge of loudspeaker design. The M Project garnered accolades and universal admiration but, alas, at its near US$130k sticker, ownership was attainable only by a privileged few. Further exclusivity was ensured via restricted production of just 50 pairs. But Magico’s ongoing success led it to develop a somewhat downscaled M Project. The new design was to incorporate many of the M Project’s technologies – some even further refined – in a more affordable speaker with wider availability as a result of a standard production run and normal product lifespan. Enter the Magico M3. Magico has developed five bespoke drivers for the 3-way M3 using diamond-coated beryllium for the tweeter and, in a world first, graphene for the midrange and bass drivers. The 28mm MBD28 tweeter is a Magico design combining a diamond coating over a beryllium dome. The combination of diamond and beryllium construction provides an ideal balance of stiffness and extreme light weight over either material, if used primarily on the entire dome. It’s a long excursion, ultra-low distortion, wide dispersion driver using a large “neodymium based” magnet system which is said to be optimised for the speaker’s sensitivity and power handling. Exotic? Indeed, but how about graphene? This is a carbon allotrope, forming as atom-thick layers of pure carbon hexagonal nanotube sections. Although first observed in the 1960s it has only come to be isolated and used in the last decade, in electronics and semiconductors and – as here – in exotic composite materials which, simplistically, are considered a hundred times stronger than steel while being extremely lightweight. And that’s pretty much a description of the ideal material for speaker drivers. The graphene diaphragm material – Magico calls it ‘Graphene Nano-Tec’ – is used in the M3’s MAG6004RTC 150mm midrange driver and a trio of 180mm MAG7012RTC bass drivers. In conjunction with the high-tech drivers, Magico’s ‘Elliptical Symmetry Crossover’ – itself carefully constructed with ultra-high quality components – provides a system impedance of 4 ohms and a reasonable sensitivity of 91dB. The speakers’ frequency response spans from 24Hz to 50kHz (no ± parameters provided) with recommended power of between 20 watts and a high 500 watts. The newly released M3 continues the departure – as first introduced in the M Project – from Magico’s previous all-aluminium enclosures. The massively-constructed cabinet is reinforced via a skeleton built around a three-axis aluminium frame structure, encapsulated in a sandwich carbon-fibre skin. A relatively new introduction to Magico speakers – as also applied across the new S series models – is a specifically-shaped proprietary polymer sub-enclosure housing the midrange driver. The entire enclosure has been carefully engineered to wring the maximum performance from the drivers by providing a solid platform totally annulling deleterious vibrations and resonances. The massive aluminium baffle’s design allows the drivers to be mounted from behind, which provides a smooth rounded profile free of unsightly mounting hardware. A shallow machined aperture curvature provides beneficial diffraction properties, and Magico has developed a special coupling system using copper gaskets said to dramatically reduce vibrational distortions. The rear panel is also constructed of machined aluminium and features a single set of high quality copper binding posts. Despite the light weight of carbon fibre in general, as used here on the side walls, the combination of massive aluminium baffle, top and bottom panels and the comprehensive bracing skeleton system translate to a speaker weighing in at around 145kg despite having moderate dimension of 1200mm high by 490mm deep and 340mm width. Magico includes a solid spiking system with the M3. However, in a substantial $14,900 optional extra, the company offers its tri-point base and M-Pod ‘noise-channelling’ vibration dissipating system, said to provide ideal coupling while offering substantial benefits in low-end transient attack and dynamic expression. O K, off the bat and purely subjectively: the M3s are among the most physically attractive speakers this writer has seen. Few would debate this, surely. They are visually commanding – yet with room-friendly stature – while being constructed to the highest levels with quite obvious obsessive attention to detail. I’ve visited the premises of Absolute Hi End on a number of occasions, becoming familiar with the acoustics of the demonstration rooms. Each studio is minimalist in terms of furniture and equipment, and is acoustically treated. As always, Absolute Hi End’s proprietor, the affable Boris Granovsky, guided me through the system components and then left me to my own devices for an extended listening session. Note pitch, decay and leading-edge transient attack across the entire bandwidth is superb. The music is propelled in a way that provides true definition to the term PRaT while piano notes wane with open, natural upper harmonics. Especially satisfying is well-recorded snare, where the snap cuts through the mix without disrupting the whole. I’m talking profound resolution capabilities here, where dense mixes are cut through with scalpel incision. This is, remember, an in-situ evaluation at the distributor’s demonstration facility, not a full formal review – which would have necessitated having the speakers within a different context, that of my own listening room and system support. Even so, it was clear that the Magico M3 represents the almost clichéd term ‘state-of-theart’ in a way that few speakers can truly claim. From the enclosure construction and stunning finish to the advanced proprietary drivers, this is a top-to-bottom piece of loudspeaker art. Magic. The M3 is the most lifelike (and least “cones-in-a-box-like”) cone speaker I’ve had in my home, and while I recently heard a Magico that betters it (and every other dynamic speaker I’ve come across)—the brand-new M6—that paragon costs a hundred thousand dollars more than the M3, is much larger and heavier than the M3 (making it potentially less of the near-perfect match that the smaller, more compact Magico is for my medium-sized room), and doesn’t better the M3 in all (or even most) ways. Indeed, these two M Series speakers are sonically so much alike that I’m going to begin this review (as I began my recent online blog about the M6) by repeating some of what I wrote about their forebear—Magico’s limited-edition, tenth-anniversary M Project loudspeaker—as neither the M3 nor the M6 would exist without it. After this, I will talk about how the M3 differs from its predecessor and how those differences affect its sonic presentation. Until Magico’s introduction of its five-driver, three-way M Project loudspeaker in 2014, I didn’t think there was a single-transducer answer to that question. But the M Pro came close to being The One—or at least closer than the other dynamic loudspeakers I was then familiar with. Though Magico claimed that the M Project didn’t measure substantially differently than its other speakers—and on a global level this was clearly true—on a local level the differences between it and other Magicos were plain to hear. Once mounted on its MPod feet (a must, BTW), the M Pro simply didn’t sound like its Q or S brethren—or at least it didn’t sound like them when it came to tonality. Oh, the M Pro had the same standard-setting (for dynamic drivers) low-level resolution of timbres and textures and the same lightning reflexes with transients as the Q Series speakers—and even lower distortion—but overall it was substantially fuller, richer, darker, and more powerful than the Qs, making for a presentation that was far more likely to appeal to musicality-first listeners, without entailing sacrifices that would limit its appeal to Magico’s traditional audience—the transparency-to-source and absolute sound crowds. Indeed, the M-Pro’s appeal to both of the latter was only increased, thanks to its denser and more lifelike tone color. What had changed? In two words, “the box.” The M Project was the first statement Magico (since the M5) that did not use an all-aluminum enclosure. It was also the first statement Magico with an aerodynamic shape. How this was accomplished without sacrificing the resonance-canceling blend of mass, stiffness, and damping of all-aluminum boxes involved a neat (and costly) bit of engineering. The M Project enclosure had a newly designed curved shape that tapered gradually from front to back, eliminating the parallel walls and sharp, potentially diffractive edges of Magico’s traditionally “squared-off” alu-minum enclosures. Instead of employing thick aluminum plates for sidewalls, the M Project used sidepieces of carbon fiber (one of the stiffest, strongest materials around). According to Magico, these curved carbon-fiber sidewalls minimized internal resonances and greatly reduced the amount of internal damping required. In addition to its curved side plates, the massive aluminum front and rear baffles were milled into curves, while the equally massive (two-inch-thick) aluminum top and bottom plates were also CNC-machined to have edgeless contours. In other words, the M Project enclosure was designed to have the lowest number of potentially diffractive surfaces of any statement Magico since the Mini and Mini II. Judging from the sound, top to bottom, it was obvious that Magico M Pro’s new enclosure was a better idea. The phenomenal clarity in the bass and power range and the remarkable resolution in the midband and the treble owed more than a little to this cabinet, which was simply allowing the drivers to sound more “freestanding” and less like drivers in a box. Like the M Project, the new M3 is a five-driver, three-way floorstanding loudspeaker with a sculpted carbon-fiber-and-aluminum box. While the driver complement is similar to that of the M Pro (one 28mm diamond-coated beryllium tweeter, one 6" graphene-Nano-Tec carbon midrange, and three 7" graphene Nano-Tec carbon woofers), the drivers themselves have been improved (for which, see below). More importantly, the enclosure has been considerably improved, making for what Magico claims is its quietest cabinet ever. Derived from the Pro (with an added fillip taken from the S Series and a new innovation in driver coupling), the M3’s box uses Magico’s traditional, massive, damped aluminum front, rear, and bottom panels and its elaborate, bolted-together, aluminum latticework/substructure inside the cabinet, but adds curved carbon-fiber side panels à la the M Pro and a brand-new aluminum top cap that has a machined-in curve to it (not found in the M Pro). The physical result is the most aerodynamic, diffraction-free enclosure Magico has come up with, and the sonic result is a disappearing act that really has to be heard to be believed. The M3s (and the M6s) come closer to the boxless openness of a great planar loudspeaker (such as the TAS 2018 Product of the Year award-winning Maggie 30.7s) than any cone speaker I’ve auditioned. Indeed, we’re so used to hearing the boxes in boxed speakers adding their own generally darker, often veiled and aggressive signature to the sound of the drivers, and to diffraction compounding this signature, that it comes as a shock not to hear these things—to hear the drivers only (or primarily), rather than the drivers interpreted by the box. On a truly neutral, full-range recording, like the fine Pentatone SACD of Stravinsky’s L’Histoire du Soldat with Paavo Järvi conducting the Deutsche Kammerphilharmonie Bremen played back through the superb MSB Select DAC tricked out with a Femto 33 clock and other power-conditioning goodies (yes, Mr. Valin is now also listening to digital), it is as if someone has sucked all the darkness (a box/driver coloration that I’ve always felt has been falsely associated with “ambience retrieval”) out of the soundfield, leaving the deep quiet and colorless air of the venue in its place, while also preserving (indeed, clarifying) the bloom of instruments into that space and the reverberant pattern of the hall. You simply have to hear this neutralizing and clarifying effect to appreciate how close the M3 comes to the sound of a boxless planar—while still retaining the virtues of the highest-linearity, lowest-distortion cones. It’s like having the best of both transducer worlds. There is an additional benefit to Magico’s best-ever, lowest-diffraction enclosure that can be heard in the seamless blend between the M3’s tweeter and midrange and the natural warmth of timbres (orchestral strings, such as those on the great RCA recording Rhapsodies with Stokowski and the RCA Symphony of the Air, are breathtakingly gorgeous), though this may also be due to refinements in the driver complement. Indeed, while similar to the M Pro, the M3 uses somewhat more sophisticated drivers than the Pro—its three 7" woofers, have later-gen graphene diaphragms (said to be 20% lighter and 300% stiffer than the nanotube-carbon cone material used in the Pro)—and a new and improved driver mounting system that employs a solid copper gasket to maximize coupling to the chassis and minimize the transference of resonances. Though the other drivers in the M3 are the same as those in the Pro—the larger (28mm) diamond-coated beryllium tweeter (also used in Q7 Mk II) and the 6" graphene-diaphragm midrange, Magico has incorporated a polymer sub-enclosure, derived from the S Series, for the midrange unit, which is said to enhance control and articulation (not that Magicos ever wanted for such things). The M Project was, IMO, the first Magico to add fully lifelike power-range beauty and muscle to Magico’s transparent and neutral palette, which made it the first Magico with equal appeal on every kind of music from rock to Rachmaninoff. The M3 and M6 take this all-genre sonic appeal several steps closer to perfection. The M3 is not merely gorgeous and thrilling sounding, though it is both of these things; it and its big brother are also getting the harmonic/dynamic envelope more right than other Magicos I’ve heard. I assume this is because their “invisible” boxes are letting their improved drivers do their work more accurately. As a result, attacks, sustains, and decays are extremely naturally reproduced, with neither starting transient nor steady-state tone nor stopping transient being overemphasized by resonances added by the enclosure (or by the drivers themselves). This makes for an astonishingly neutral, liquid, open, bloomy, and “organic” presentation, closer to the way instruments sound in life. Take, for instance, the M3’s reproduction of the bass drum in “Marche du soldat” from the aforementioned Pentatone recording of Stravinsky’s L’Histoire. Used as it is in this movement, as martial punctuation, it should have a sharp attack when it is struck hard (as it is here), develop clean low-frequency presence (kind of like a sonic “rebound” effect in which you hear the flex of the batter head followed by the barrel-like tone of the sound box), with all tone dying off as soon as the drum is damped by hand or knee or both. The M3 captures this harmonic/dynamic sequence with uncanny realism, without losing grip and definition, “darkening” timbre, or prolonging decay. It gives percussion the crisp, clear, powerful, unsmeared sound it has in a concert hall. And it does the same trick with the attack, tone, and decay of every one of the other instruments in the Stravinsky suite—from violin to clarinet to cornet to bassoon to trombone to contrabass. Although the M Project was (and is) no slouch at staging and imaging, the M3 and M6 also represent a significant advance in both areas—once again, I assume, because of their improved boxes and drivers. Neither has the lifelike image size of something like the Magnepan 30.7 on big instruments such as pianos. But both have better focus and dimensionality, more stage depth and width (not height), and more visceral slam than the Maggies. But then both are a good deal more expensive than the 30.7s (and, let’s be honest, a good deal easier to house and live with in a normal-sized listening room than those giant planars). The M3 is also “Maggie-like” (or electrostat-like) in other ways: It is a monster when it comes to transient speed and the retrieval of low-level detail—even better than previous Magicos and, as most of you know, Magicos have never wanted for resolution. Once again, I assume this turbo-boost in detail retrieval is owed to the quieter box (and improved drivers). You’re certainly not going to miss anything with these babies. Harry Connick’s very soft finger snaps towards the close of “Berkeley Square,” the rush of breath through the mouthpiece as Branford Marsalis holds onto that last note on the same song...you name it, and it’s unmistakably there. But, thanks to the M Series’ fuller power range and better-blended tweeter, it’s there without the sulfur of the analytical—with the fuller, more natural color and dimensionality of the real thing. Obviously the M3 gets my highest recommendation. It is as good a dynamic loudspeaker as you can buy. Do remember, though, that to elicit the very best from one of the most accurate and realistic transducers on the market you’ll need electronics that are just as high in resolution and as low in distortion/coloration as the M3s. In my experience that means something solid-state from the Swiss contingent (i.e., Soulution or CH Precision) or from the best American marques (Constellation, D’Agostino, etc.). I haven’t tried the M3s with tubes, but Magicos typically don’t fare as well with glass bottles as they do with silicon semiconductors (Convergent Audio Technology being the exception). All of this means that M3s aren’t just a loudspeaker purchase; they are a system purchase (including cabling, BTW). In other words, they are for the wealthy. MAGICO M3's with VITUS SS-103 stereo power amp and VITUS SL-102 Mk2 preamp. Absolutely amazing!